VINYL ON VINYL: Vinyl on Vinyl collaborates with Vannen and Huck Gee! Vinyl on Vinyl collaborates with Vannen and Huck Gee! On February 8th, Vannen is pleased to present a special watch release so big it spans continents. When Huck Gee's "Killing Time" sold out in November, fans around the world wrote to us asking for more. Once our art watches are gone, they're gone, but Vannen couldn't say no to friends at Vinyl on Vinyl. Located in the Philippines, a place that's no stranger to Huck Gee special releases, Huck's new watch, "Lifetime" is sure to go quick! "Lifetime" features Huck's iconic "Skullhead" on the face and a repeating skull and crossbones design on the strap. While "Killing Time" represented death, "Lifetime" represents life. With a pure white color palette and a crown and back case etched with the Kanji for "life," this timepiece is all about living. Together, "Killing Time" and "Lifetime" parallel the Chinese philosophy of Yin and Yang, with life and death giving rise to each other in turn. The release of "Lifetime" as a shared exclusive between Vannen and Vinyl on Vinyl commemorates the gallery's 1-year anniversary. "Lifetime" is limited to 150 pieces, retails for PHP 4250.00 and comes with signed and number packaging. Choose Life exclusively at VinylOnVinylGallery.com,VannenWatches.com and at HuckGee.com. 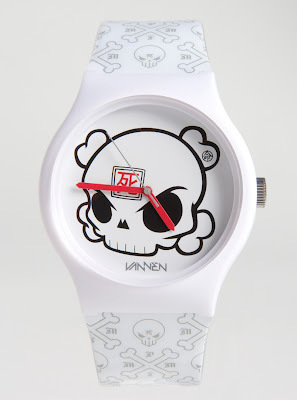 For more information on Vannen, please visit: www.vannenwatches.com.